(Newser) – Just like a Starbucks customer can match her perc to her personality via a customized coffee, company baristas can now also "shine as individuals" thanks to the java giant's updated dress code. Per a company release posted Monday, baristas are now allowed to diverge somewhat from the black, white, and khaki attire that's been the Starbucks standard. 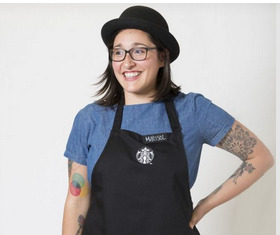 Although the green aprons aren't going anywhere, baristas can now wear navy, brown, and gray clothing underneath, as long as it presents a "clean, neat, and professional appearance." Wild hair hues, previously forbidden, are also now welcome—though it has to be permanent or semi-permanent color and can't have glitter or spray in it for health reasons, Fortune notes—and employees can top off their tresses with beanies, fedoras, or other "suitable" headwear within the same color approved color scheme.